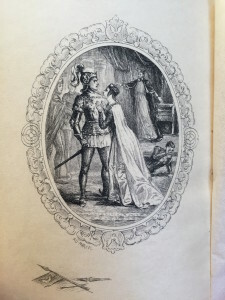 Book series that gather and reprint public domain fiction have a long history. Perhaps the earliest series was Poets of Great Britain Complete from Chaucer to Churchill, founded by British publisher John Bell in 1777. 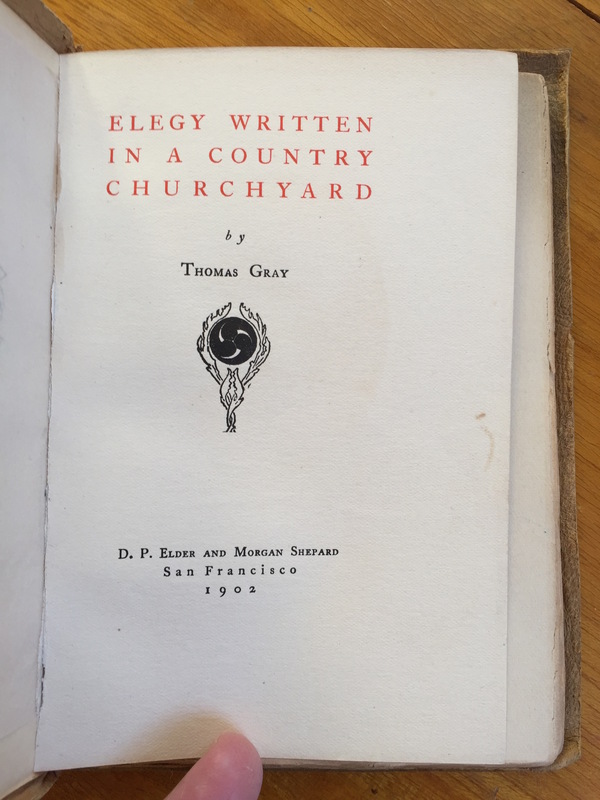 Later British series included Routledge’s Railway Library (1848–99) and the Everyman’s Library (1906-). A well-known American example is the Modern Library (1925-70). 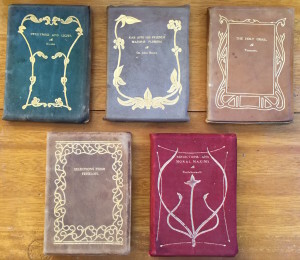 Book series were a familiar sight at any turn-of-the-century bookstore. Impression Classics. A selected series of the shorter gems of literature. 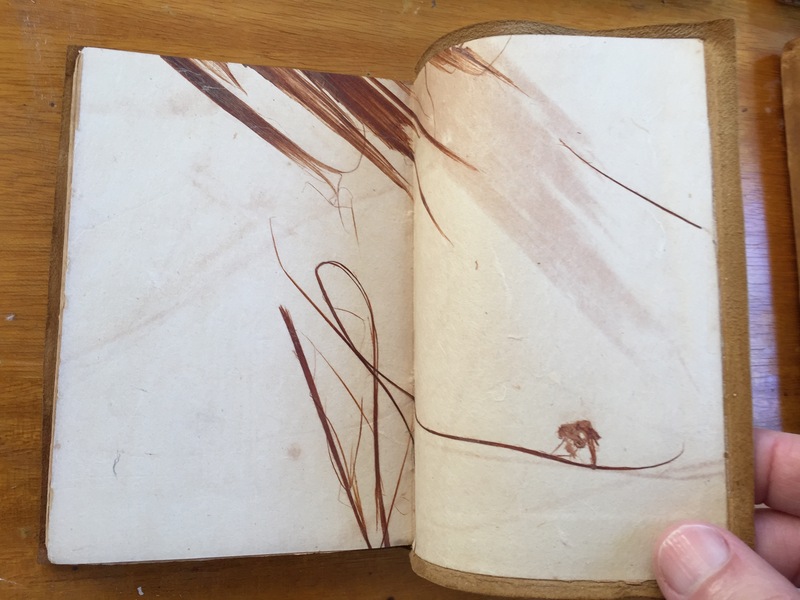 Beautifully printed on deckle-edged paper, with title page in two colors and etching frontispiece on Japan vellum. Bound in flexible grained lambskin with original design. Boxed. $1.25 net. 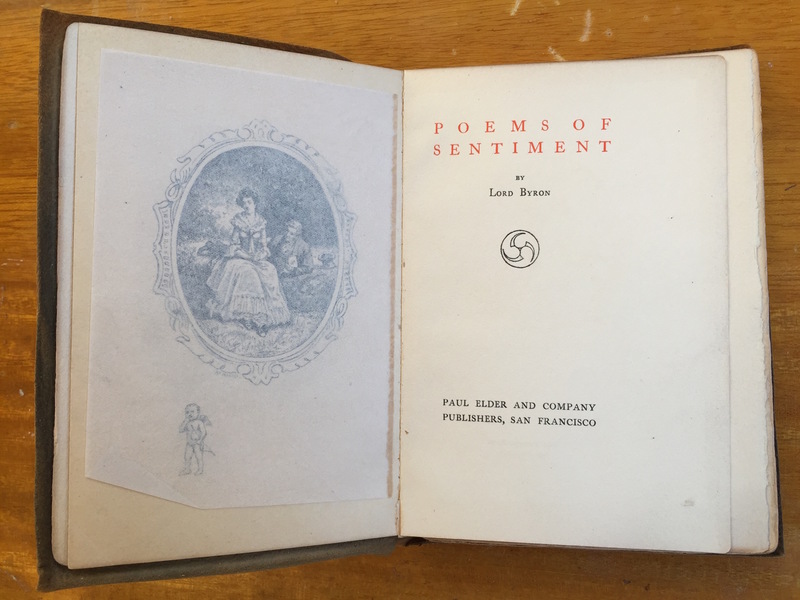 Title page and frontispiece of “Poems of Sentiment,” Paul Elder & Company, 1904. The tomoye design is much simpler than the 1902 version. 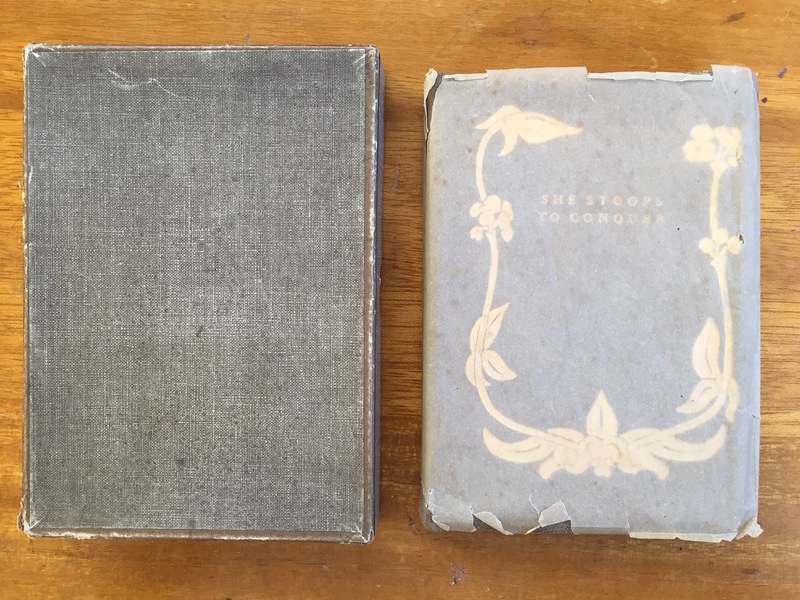 The original 1902 printings were published by Elder & Shepard, and printed by the Stanley-Taylor Company. 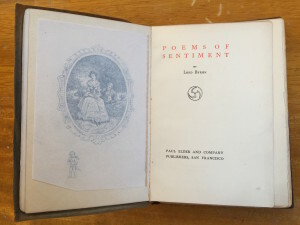 Many of the titles were reprinted several years later, with the new Paul Elder & Company name and printed at the in-house Tomoye Press, but other than the title page the two printings are indistinguishable. 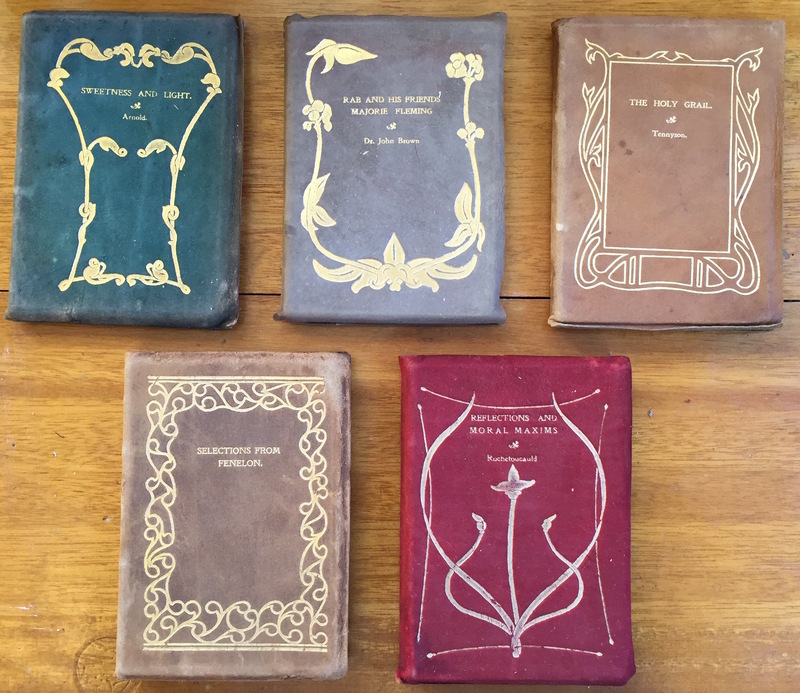 There are five known cover designs (presumably by Morgan Shepard) and three different colors of leather (brown, green, red). 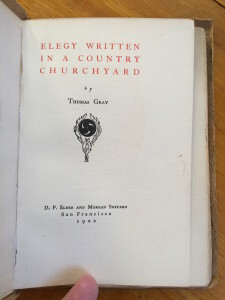 The title pages are in two colors, and include one of two tomoye designs. There is a half-title page containing only the text “Impression Classics.” Many copies have endpapers containing strips of bark, something Elder used in a number of his other publications. The leather is good quality and has held up reasonably well, much better than the Panel Books, for example. 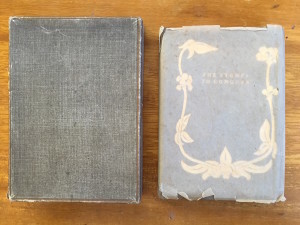 The books were sold in unmarked boxes, protected by an unmarked glassine dust jacket, neither of which typically survive. Each volume has a frontispiece by A. D. Marcel (of the fourteen titles I have seen, all frontispieces are clearly by the same artist, but only six are signed by Marcel), about whom I have been unable to find any information. Some of the titles include a short introduction, usually anonymous. The one signed introduction which has been seen is by William A. Hovey, in O’Reilly’s Selected Poems (#36). Hovey (1841-1906) was a newspaper editor in Boston, and evidently a good friend of the poet.